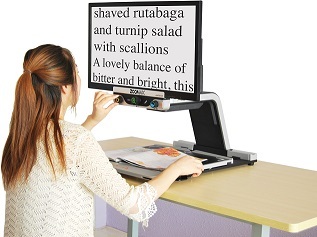 The Aurora 24" HD Desktop Magnifier provides the sharpest and most comfortable image for visually impaired users. With its 24" screen, foldable feature, and high definition quality, the Aurora is the best priced magnifier in its class. While taking the best HD camera and advanced auto focus technology, Aurora HD provides the sharpest and most comfortable image for visually impaired users. The characters holds sharp edges at different magnification levels and movements. You could also select your favorite color mode among 17 alternative viewing modes. That means you can read the newspaper or bills, also view your favorite collection of jewels, coins, or cards, sign documents or even write letters in focus as long as you wish with less eye strain. Become a reseller of our blindness and low vision products.